Why should I use a FIDI FAIM company for international removals? 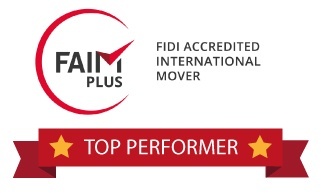 FIDI FAIM certification means your international removals company is fully qualified, licensed and independently pre-vetted for overseas moving giving you peace of mind you're chosing a reputable mover. Moving abroad is one of the biggest and most daunting experiences a person can go through; you’re not just moving your household items from one part of the same country to another, but moving your entire life to another place that’s probably completely out of your comfort zone. That’s why, when it comes to the move itself, you need an international removal company you can trust from the moment your belongings are packed, right through to the moment they reach you in your new destination. logo to know that you’re picking a company that can deliver the highest standards of service and quality for your move. "is the global alliance of professional international moving and relocation companies that specialise in moving household goods and personal effects from one country to another, from one continent to another, according to the best quality standards. Representing over 600 independent removal companies in more than 100 countries, FIDI is the largest umbrella organisation of international removals and relocation companies. It is the only moving organisation to set a quality benchmark for its members…meaning those that make the FIDI cut are the best of the best." Got it, so what's FAIM? As part of FIDI’s quest to ensure only the best removal companies can achieve its accreditation standards, the organisation introduced the FAIM (Fidi Accredited International Mover) quality management programme in 1997. FAIM is the most rigorous and only quality certification programme dedicated exclusively to the international moving industry. In order to be FAIM certified by FIDI, a company has to comply with over 200 quality requirements which cover every aspect of the administration and performance of an international removal – everything from operations and services to insurance claims for damage, staff training and vehicle and warehouse maintenance. FAIM isn't a 'once and done' certification, FIDI companies must be audited every 3 years to ensure their standards remain at acceptable levels. See the results of Bournes most recent FIDI FAIM Audit where we achieved "Top Performer" status. Why use a FIDI-FAIM accredited removal company? Good question – what exactly makes these companies a better choice for international shipping? In short, when things go wrong with an international move, not only do they cost time and money to fix, but they add stress and worry to the situation. The main aim of using a FIDI-FAIM approved removal company is to eliminate or reduce the risk of things going wrong to give you peace of mind you're in safe hands. Here are some other tips for choosing an international removal company. To answer this question further you need to consider all of the things that could possibly go wrong with your move. International Removals is a risky business! Did you know a cargo ship can move in up to 7 different directions when its on the water, and that the amount of movement can vary greatly especially in stormy waters. Then there is all the extra people involved in an overseas move compared to a local one, there are packers and drivers to collect your belongings, port authority workers to load the container on the ship and unload them at the other end, customs inspectors and then another driver and unpacking crew to return your belongings back to you. That means lots of extra 'handling' and hand off points compared to a local house move, and this needs carefully controlling. You also need to make sure all the right permits and paperwork is in place so that everything runs smoothly and your items don't get held in customs causing you additional charges and extra time without your belongings. Together these factors making an international move high risk and potentially highly stressful because of all the things that COULD go wrong if your moving company don't get all these little details right. What ARE the risks of international removals then? Damage to or loss of your personal effects - caused by poor packing, inadequate packing materials, unsuitable shipping containers (smelly or leaking), careless handling, poor security, bad record keeping etc. Damage to your home at origin or destination - caused by a lack of care or failure to protect your property before goods are moved in/out etc. Delays - caused by badly maintained vehicles that break down, documentation not being completed or submitted properly, missing or incorrect information, in-appropriate choice of shipping arrangements etc. Financial failure of your moving company - door to door an International removal can take anywhere from a few weeks to several months. What happens to your belongings if the worst happens and your moving company goes out of business whilst your shipment is in transit? Loss or misuse of your personal information - caused by poor information handling or lack of security in information systems. How do FIDI FAIM certified companies reduce these risk of international removals? Operations – including checks that we are operating legally and safely, with the appropriate permits and licenses, with responsibility toward environmental protection. This includes all suppliers that we work with at destination. Data security and Ethical conduct - for example making sure our IT systems are secure and we don't engage in bribery or corruption. Procedures – to make sure we eliminate loopholes in the Sales and coordination process that could lead to mistakes. This includes the clarity and transparency of our contracts, what documentation we provide, how and when and our communication and responsiveness. Customer service – how we handle claims and complaints, the number we receive and our customer feedback levels. Vehicles – their suitability for international moves, cleanliness, theft protection measures such as tracking, up to date licenses and legal operation, fire protection and safety checks. Qualified Staff - at least 10% of our staff must have 3yrs + experience (our average length of service is 9.5years) and checks that the training we provide ensures they are qualified and capable of doing their job well (for example manual handling, customer service and cultural awareness). Warehouses and facilities - ensuring we have professional offices, warehouses and supporting equipment that are safe and fit for purpose including security, maintenance and fire protection. Financial Stability - to demonstrate a reduced risk to our customers of us going out of business. (TIP: If you choose a FIDI member that is also a member of the BAR overseas group your advance payment is protected in the event of your moving company going out of business to provide extra peace of mind). I’ve read that using a FIDI company can save me money – how is this possible? One of the key factors when it comes to moving internationally is risk assessment. As we said above, moving is, by nature, a high risk industry – whether that’s simply moving 100 yards down the road, or 10,000 miles across another continent. The risks increase the further you move, so it’s especially important to be fully prepared and carry out the necessary assessments when moving abroad. All FIDI companies will be trained to spot these risks and know how to deal with them if and when they arise. For example, the very first meeting you have with someone from an international removal company will be at your pre-move survey. Here, the surveyor will be trained in accordance with FIDI guidelines to accurately assess the volume of your consignment. Significantly under or over estimating this amount can end up with you paying more than you needed to or facing additional charges later on. Alongside that, they will be able to advise what you can and can’t take to your destination country, saving you the hassle of packing things that might be cost you a lot of money in fines or quarantine treatment when they reach customs. They’ll advise you how best to clean items like garden furniture or vehicles – other things that can be very expensive if flagged at customs. On moving day, the specially trained packers will know exactly how to pack and load your shipment to avoid damage at sea. This reduces the risk of breakage and having to make a claim when you reach your destination. In the office, your Move Manager will be trained to guide you through the paperwork you need to complete e.g. immigration and customs forms, and advice on insurance. They will keep you updated on any major developments that can affect your shipment; things like port closures or strikes, or changes to laws and processes that might cause you extra costs if you don't know about them. I’ve used a FIDI removal company at my origin, but what about at my destination? I’m worried the standards won’t be as good. Part of the audit process is checking how companies choose their approved suppliers, making sure we have service level agreements in place and have vetted them carefully to make sure we trust them with your shipment. Typically FIDI companies work with other FIDI companies, ensuring you have the same, high standard of move from start to finish. The FIDI network is vast and in most cases wherever you go in the world there will be a partner company dealing with your shipment at your destination that has the same quality of standards as the one in your origin. So, If you’re about to plan a move abroad then make sure you look for the FIDI FAIM logo when choosing your international removal company. bournes are a FIDI Top Performer! Bournes International Moves recently completed a successful FIDI-FAIM audit – see how we did and why we were named here. For more information about FIDI and the FAIM certification, visit the FIDI website.